Last week 45 Jews, Christians and Muslims spent four days and three nights together at a Jewish Christian Muslim Association (JCMA) Conference in Warburton, discussing and sharing each other’s faith and religious practice. “Why bother” I hear you mutter disparagingly. After all, the Jews of Nazi Germany were well integrated and had developed good relationships with their Aryan neighbours, yet this didn’t prevent Nazi Germany from committing the greatest genocide known to man. Are those who attended the conference therefore merely naive ‘do-gooders’, out of touch with the reality of the world? The conference ran to a tight schedule with a focus on the prophet motif and how each of the Abrahamic religions view and interpret the prophets, their commonalities and their messages for today. It quickly became apparent (rather fortunately for me, who has little knowledge of religious texts! ), that this topic was merely an icebreaker for the conversation, understanding and trust that would develop over the coming days, as well as a fascinating insight into how we interpret our faith, our scripture and our religion. Each day started with meditation and concluded with prayer, one faith per day. The Jews, being the oldest of the Abrahamic faiths, were the first, followed by our Christian and then our Muslim counterparts. The meditations were beautiful, soulful and – dare I say it – indistinguishable in their faith origins, with each celebrating the world through picture, music and song. As an infrequent shule goer, who valiantly struggles against a rising tide of prayer-invoked slumber, I was less than impressed at being expected to attend evening prayers. I was thus surprised to discover that they were intriguing in their commonalities of praising G-d, use of psalm and verse, and meaning. Moreover, I found the explanations in plain English did much to assist my connection to Hashem, when compared to the Hebrew phrases with which I am both familiar and comfortable, yet understand so little! These sessions built for me a picture of our shared Abrahamic background, not just in our acceptance of Torah but in our paths to G-d. Each of our faiths focuses on social justice, the living of just lives and a connection to a greater entity. In the past I had only seen the three faiths in their differences, in where we stop and the Christians and Muslims begin. However, the conference developed in me a new respect for the other religions, and the awareness that although our practice is different, our hearts and minds are aligned together in our faith and connections to G-d.
A unique aspect of this interfaith gathering was the ability to ask normally unmentionable questions in a safe and respectful environment. I should note that at all times we were advised to speak only for ourselves and not for all Jews. This was poignant when I was asked to speak – alongside a Muslim and a Christian – about my personal faith journey. I was at first hesitant to reflect on my faith when surrounded by Rabbis and Ministers for whom I was sure faith would be far more omnipresent than my fledgling secular-orthodox, recently-turned-conservative affiliation. Yet speak I did, about my experiences of religious vilification by friends and strangers; my struggle to define myself as a ‘good Jew’ when my practice is limited; the realisation that my Jewishness is inherent and built upon a platform of family and community; and my search for the legacy that I will pass to my children, all too aware that Jewish continuity is threatened. I was stunned to find that the views of many in the room not only resonated with me, but that as a result of the shared humanity and understanding of our religious purpose in the three personal stories, the barriers and differences between us evaporated. Most of the people who attended the conference were open to learning and listening, certain political topics were out of bounds and antagonism was actively discouraged. The conference organisers should be commended for scaffolding this nurturing environment. 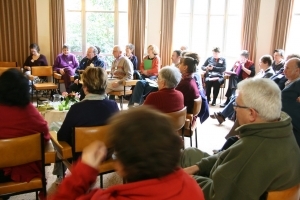 It is, nonetheless, an artificial environment; the sessions are structured; we are mindful of offending; there is time and support from others to work through concerns and disagreements; few people have four days to commit to interfaith dialogue and we are there with a shared objective – to learn in a beautiful and work-free setting. The ‘real’ world presents pressures and when it comes to the crunch and life goes horribly wrong, old prejudices are likely to resurface. However, I believe that if enough people would meet and talk, and understand each other beyond prejudice and difference, the seeds that were planted and nurtured at this conference would spread, encouraging us to live not only alongside each other but to support and respect each other. This is the heart of our multicultural society, our religion and our faith, as said by the prophet Michah, “To Do Justice, and to Love Kindness, and to Walk Humbly with your God”. The interfaith path is a beautiful and interesting journey in exploring people’s minds, souls and beliefs. The journey may be fraught but we have to be willing to undertake it.